Irwin and Cochran. Photo by Michael Brosilow. Lucas Hnath’s play The Christians at Steppenwolf Theatre challenges the belief systems of its characters on stage as well as those of religious and nonreligious audience members. The heart of The Christians is a doctrinal dispute between the pastor of a conservative megachurch and his associate pastor, as well as his wife and many of his parishioners. Pastor Paul (Tom Irwin) gives a provocative sermon to his flock (which includes the Steppenwolf audience). He tells a story about a young man in a Middle Eastern country who runs into a burning building to save his young sister and dies as a result. Pastor Paul concludes that someone who performed such an act could not be condemned to hell because he was not a Christian. In the process Paul has tense debates with Elder Jay (Robert Breuler) speaking for the church’s board of elders, with an emotional congregant (Jacqueline Williams), and with his own wife (Shannon Cochran). The series of debates, carried on as each speaker uses a handheld microphone as if conscious of his or her role in speaking for the faithful, profoundly impacts Pastor Paul’s life and career. Todd Freeman’s direction is so sharp that the debate proceeds as if choreographed. Irwin’s performance is entirely credible with a minimum of the unctuousness that one might expect of such a pastor. Davis, Cochran and Williams also are believable in their opposition to the doctrinal heresy espoused by Paul. The setting is the Steppenwolf stage decked out like a church sanctuary with choir, band, floral arrangements and a giant lighted cross on the back wall of the stage. If church is not the place you go every weekend—or ever go, since you escaped parental dictates—walking into Steppenwolf’s Downstairs Theatre is a culture shock. 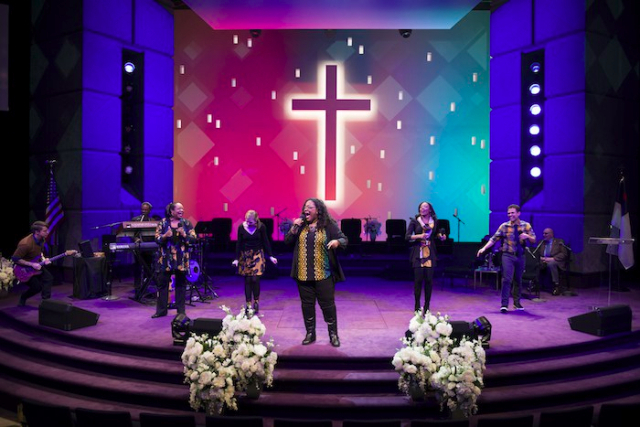 A multicultural choir accompanied by percussion and keyboards sings bouncy Christian hymns with lyrics projected on screens at each side of the stage. The choir members meander in casually about 15 minutes before showtime. The music begins soon afterward and continues for at least 20 minutes. Once the over-the-top musical aperitif ends, Pastor Paul announces we are going to pray. A fair number of people around me closed their eyes as if they were going to do that. Hnath’s script specifies the staging described above. As he says in the introduction to his script, “The whole play is a kind of sermon. Sometimes it’s a literal sermon. Sometimes it’s made up of scenes that use the formal elements of a sermon, and as such, even the most private scene has a kind of declamatory, performative, sing-songy quality.” Freeman’s staging and the pervasive mics enhance this sermon-like quality. Walt Spangler created the sanctuary scenic design highlighted by Scott Zielinski’s dramatic lighting design. Musical direction is by Jaret Landon, the keyboard player and singer. Leonard Maddox Jr. is on percussion. The other choir members are Charles Strater, Faith Howard, Yando Lopez, Jazelle Morriss, Mary-Margaret Roberts and Jacqueline Williams. Hnath is the author of Isaac’s Eye, a play about a scientific dispute between Isaac Newton and Robert Hooke, staged in 2014 at Writers Theatre. His other plays include Red Speedo and Hillary and Clinton, produced this year at Victory Gardens Theater. He is a resident playwright at New Dramatists in New York. 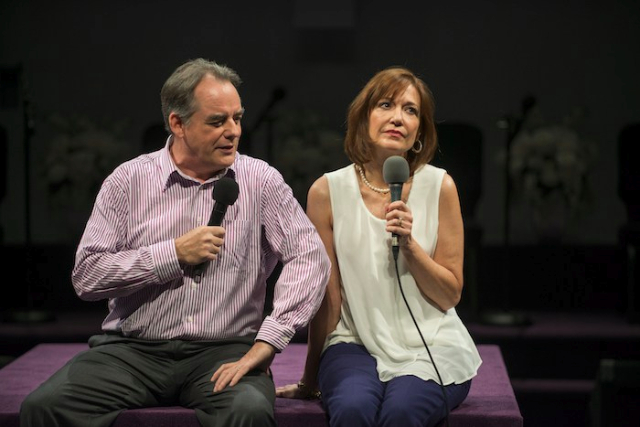 The Christians continues at Steppenwolf Theatre, 1650 N. Halsted, through January 29. Performances are Tuesday-Sunday with tickets priced at $65-89 with discounts available.